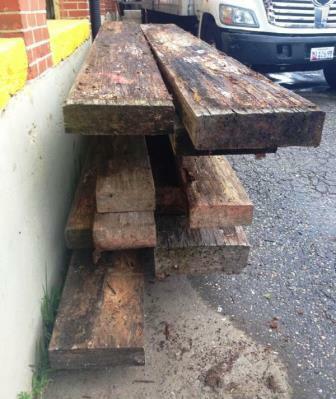 We recently received some random strand wooden support beams. They are healthily weathered, so they are no longer suitable for structural building, but would make a lovely bench or landscaping structure. We have a limited supply available and they are just $0.50 – $1.00 per linear foot. Weathered industrial items like this usually go quickly – so you can call us, but our Reuse Associates probably won’t know what we have left in stock (it’s kind of like calling Goodwill during a half-price sale to ask how many shirts they have!). So you should visit soon for the best selection. On weekdays, we’re open 10-6. We’re now open a little later on Wednesdays too – till 7pm! And we’re open Saturdays & Sundays from 9-6. Hope to see you soon!